Are we all good? Everybody set for another installment of our weekly “5 Questions” interview series? Because here’s Jessica Olien. 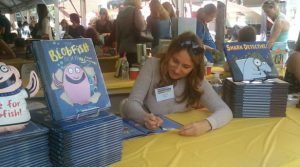 Maybe she’ll stop signing books long enough for a friendly chat. Her blobfish book just might surprise you. Jessica, hey. There’s a great scene in “The Sunshine Boys,” starring Walter Matthau and George Burns, where Uncle Willy explains that “Words with k in it are funny.” He lists: pickle, chicken, Alka-seltzer. Uncle Willy adds, “’L’s are not funny. M’s are not funny. Cupcake is funny, tomatoes is not funny, lettuce is not funny, cucumber is funny . . . Cockroach is funny — not if you get ‘em, only if you say ‘em.” The idea is that certain words are inherently funny. Which leads me to Blobfish. How do you not smile when you hear that word? Indeed. Poor lettuce, what a terrible dinner party guest. Blobfish is most definitely funny, but as with most comedians is also seriously misunderstood! There’s a deeper layer to your book, slowly revealed, that leads the reader to an unexpected place. First, on the surface, there’s straight-forward science. From what I understand, there’s been significant advances deep ocean research, where we’re now getting glimpses of these incredibly weird fish. My favorite is Vampyroteuthis infernalis (loosely translated as “Vampire Squid from Hell”). It all gets pretty bizarre down in the Hadalpelagic Zone. All of that information in your book is conveyed in a fairly conventional photographic manner. 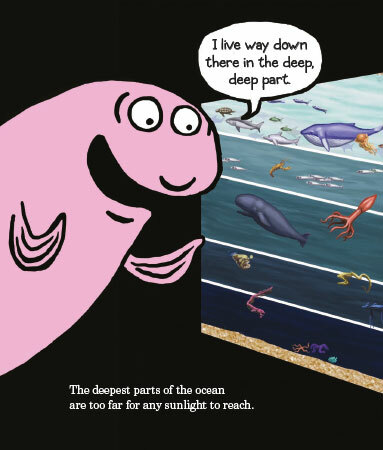 Then we meet your illustrated Blobfish character. Which came first? Definitely Blobfish came first. I had this idea kind of whole — an attention-seeking fish looking to recognize himself in the pages of a dry textbook. To get the photos (which are mostly of the deep deep sea) I had to contact different scientists around the world, which was fun but challenging when they were off searching for Japanese Spider Crabs or whatever and couldn’t get back to me for permissions. Well thank you! 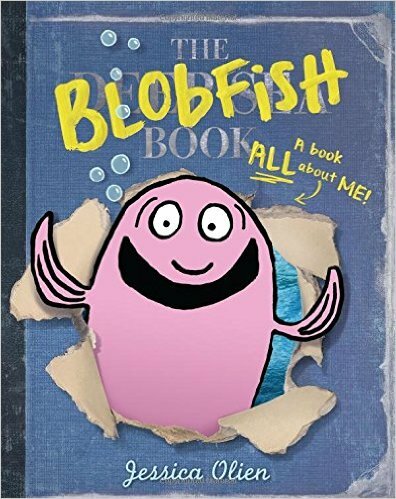 I think I actually read that the Blobfish was voted the ugliest animal on BBC or something and that’s where the idea for this book came from. That and a bunch of really weird sketches of Blobfish — you should see one of the early ones, he looks kind of like Danny DeVito. DeVito should play him in the movie. I can totally see that. He has the range. But continue. I loved thinking about a lumpy fish with this child-like enthusiasm about his own worth. Blobfish craves validation and belonging and while he looks for it he finds out that some people have not very nice views of him. I think this is a defining moment for many kids too. When they realize people aren’t all on their side. It feels so unfair (it is unfair). Different versions of this happen our entire lives and it is up to the kindness of others and our own ability to recognize and embrace that kindness (as well as to forgive our own flaws) that keeps us going. I see that you live in Brooklyn, as required by law for children’s authors and illustrators (I think it’s a five-year minimum, then you are free to move to Connecticut). Yet you are a native Midwesterner. Where’s that? I was born in Michigan and raised in Wisconsin. I never felt like I fit in anywhere. All I wanted to do was explore the world and be a writer, an artist, an actor. Being from the Midwest you are taught to keep your expectations low and your ambition in check. I couldn’t wait to leave. I moved to Chicago to study photography, then dropped out of school and moved to Thailand where I worked as a journalist. I finished my degree remotely while studying Arabic in Egypt. Right. 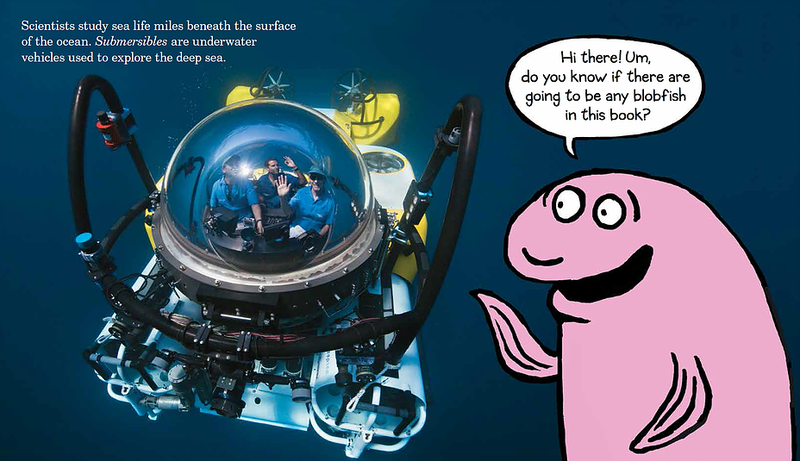 Given that progression, writing and illustrating a children’s book about a blobfish makes perfect sense. Because: inevitable. Your voice strikes me as something new. How did you arrive at children’s books? It’s like you climbed in a window or something. It does sometimes feel that way — “This is not my beautiful house.” I always say I didn’t do this until a few years ago, but recently I looked back at some of my sketchbooks that I kept while traveling and mixed in with these serious sketches of urban decay and poverty were these funny cartoon animals and people. I am so glad I didn’t pursue picture books right out of school though. Something about not caring as much what people think when I did start out made it easier to have an authentic voice. Also, I was lucky to have Alessandra Balzer buy my first book (and four after). If she hadn’t taken it I might not even know there was a window for me to climb into. Thanks for visiting, Jessica. Keep up the great work. 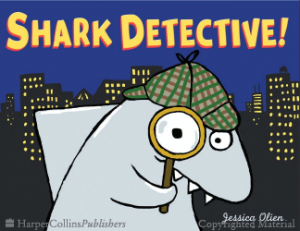 JESSICA OLIEN is also the author/illustrator of Shark Detective! and Adrift. She has several books in pre-publication, but the one I’m most excited about it titled Right Now (2018). I guess we’ll have to wait for it. Hum-dee-dum, dee-dum-dum. Jessica keeps a fancy website that you can visit. Google’ll get you there. Coming soon: London Ladd, Matthew Cordell, Lizzy Rockwell, Nancy Castaldo, Aaron Becker, Matthew Phelan, and more. You can look up previous interviews in this series by clicking on the “5 Questions” icon under the “categories” on the right sidebar.